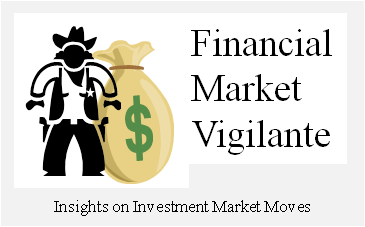 Financial Market Vigilante: Quantitative Easing – Is it Inflationary or Deflationary? There is a saying in life that “too much of a good thing can…” You can add your own perspective. But when it comes to a country’s currency, the answer is always an outcome which requires either a reversal of policy or an igniting of inflation, which begets a reversal of policy. In both cases, the remedy results in the market breakdown, it is only a question of how the party is ended. How Much Excess is in the Monetary System? The Federal Reserve actually tracks the level of excess in the monetary system. The measure is known as “excess reserves” in the banking system. 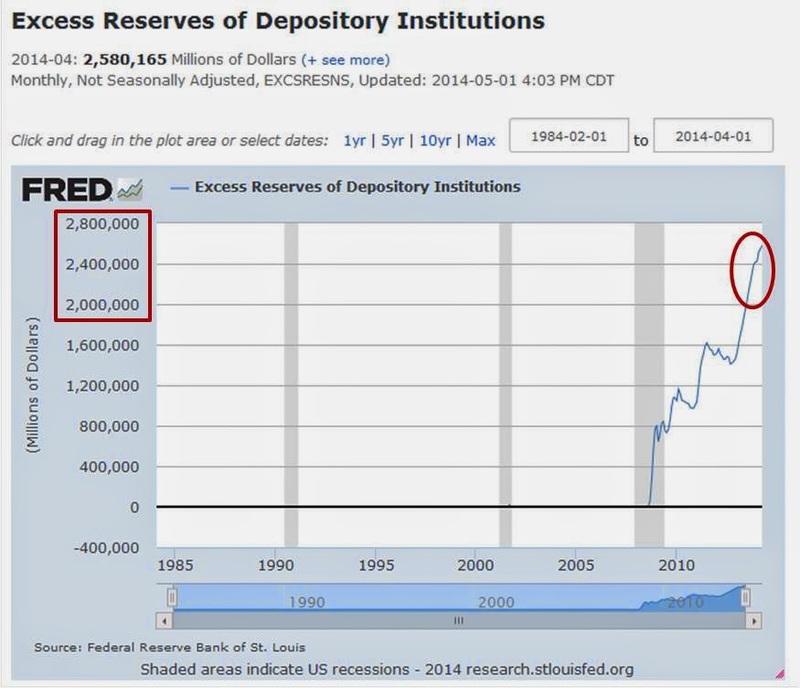 As of the end of April 2014 the level of excess reserves in the U.S. banking system held by depository institutions were a whopping $2.58 Trillion. What this information means is that quantitative easing has created an enormous amount of cash in the monetary system; however, the full force of the excess liquidity has not flowed into the economy. The bulk of the Fed balance sheet ($2.58 Trillion out of $4.31T Trillion) remains unlevered and parked at the Fed collecting .25%. This path in monetary policy is new for the U.S. as the above graph shows. Before Obama took office, the Fed did not leave excess reserves in the system. Instead the Fed policy targeted the Fed funds rate at a level which kept the reserve ratio in the banking system in equilibrium. The interest rates set in the market were a very powerful force which invoked a level of discipline on the monetary system. With this new policy, the Fed is far more dependent upon on regulatory policy and government coercion to make sure that the money supply does not run out of control. Because a big portion of the excess reserves are not currently being lent to “Main Street” businesses at the rate they could be, there is a implied force which is both slowing economic growth as well as slowing the ability of inflation to run out of control. But there is also another driver which is counter inflationary, government fiscal spending. Historically high Federal Reserve quantitative easing has corresponded with high rates of growth in government spending (don’t confuse this with high absolute levels of spending; rate of change is the important variable). In simple terms, if the government suddenly starts to demand greater levels of funds to support spending programs (entitlement, defense, other), you can be sure the excess deposits held at the Fed will very likely flow into the economy, escaping the current quarantine program. Depending on how the government spending programs are funded, taxes or borrowing, the general price level of the economy will react in different fashion. Quantitative easing (QE) in isolation is not how consumer price inflation is created in an economy. The present QE path is structured in a fashion that creates “asset bubbles”. In fact, the present policy is being implemented for the sole purpose of maintaining one bubble intentionally, the high price level of U.S Treasuries. With this policy, interest rates paid by the U.S. government are minimized and the excessive level of the U.S. debt relative to the country’s GDP (currently over 100%) are kept from causing the U.S government to either lower other government programs due to the burden of interest payments, or the contrary path of simply growing government spending levels at higher rates, flooding the market with more and more money. Can this monetary illusion be maintained indefinitely? There are currently major risks surfacing in the world economy which point to the growing risk that this “excessive” policy will uncork a financial calamity. Will the calamity be driven by inflation or deflation? The answer to this question depends on the force which always has a much greater impact on the inflation outcome in the U.S. economy – government’s tax and spending policy. 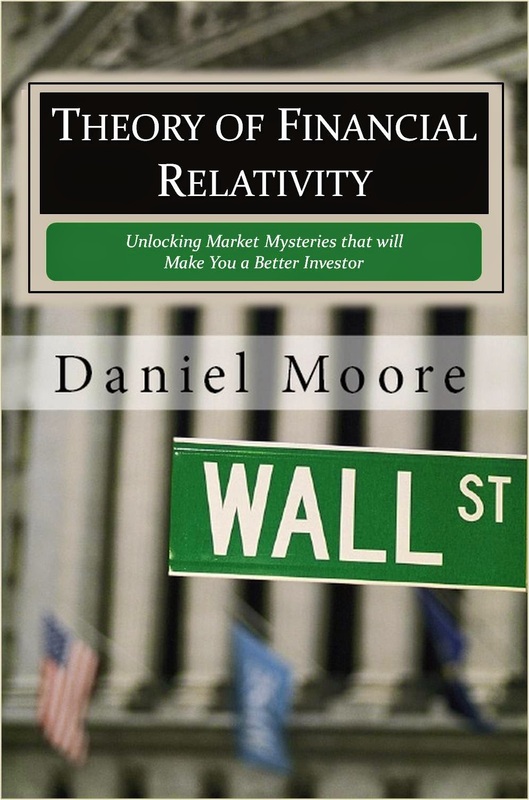 To understand the “Dirty Little Secret” of what drives consumer price forces in the economy throughout history and what must change in order for the present U.S. economic course to turn from deflation into a 1970s style stagflation, pick up a copy of Theory of Financial Relativity – Unlocking Market Mysteries that will Make You a Better Investor.